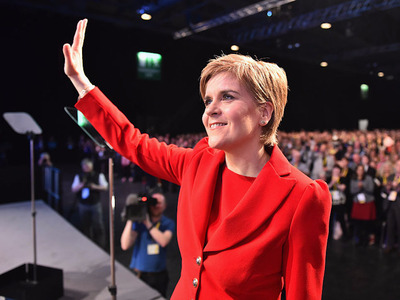 Jeff J Mitchell / GettyScotland leader Nicola Sturgeon is a ‘canny’ politician who would not promise something she could not deliver, according to Dr Catterall. Scotland is very unlikely to get another independence referendum, says constitutional expert Dr. Peter Catterall of Westminster University. This is because it would be hugely “messy” on a political level and because the Scottish economy simply cannot handle a succession right now, he told Business Insider’s Lianna Brinded in a Facebook Live interview. In 2014, 55% of Scots voted to stay in the UK while 45% pipped for independence. However, since Scotland overwhelmingly voted to remain in the EU referendum (62%), but Britain as a whole voted for a Brexit, Scottish National Party leader Nicola Sturgeon has been gunning for another independence referendum. Dr Catterall did say, however, that Scottish National Party leader Nicola Sturgeon was extremely “canny,” and that she was the only politician who had risen to level the events demanded in the wake of the Brexit chaos — which saw Prime Minister David Cameron resign on Friday and both of the UK’s main political parties scramble to secure their positions. First things first: Scotland may have its own parliament, but to hold a national referendum it still needs permission from Westminster in London. Over 55% of the country voted to stay in the UK in the last independence referendum in 2014, undoubtedly a healthy margin which surprised expectations. “The argument the UK government may put forward is that it needs to approve a second Scottish referendum and could, in theory, withhold the consent. When the Americans wanted independence in 1776 they did it by violence. We don’t want that — we want to follow constitutional procedure. The question then becomes, how far do you push against the inevitable? Scotland’s claim to North Sea oil was major factor in the pro-independence campaigners’ manifesto, but oil has more than halved in value in the last year and a half, as has the share prices of RBS which had to be rescued by the British government after the 2008 financial crash — further complicating any talk of Scottish succession. Scotland’s economy has grown far more slowly than the rest of the UK as a whole since the last recession, the Guardian notes, with just a 4% GDP growth compared to the UK economy as a whole which grew 23% in cash terms. This is not the picture of a country ready to go it alone, even with the EU membership it already enjoys. Two major things Scotland will have to decide before another independence referendum is whether to join the Euro currency — maybe not a bad idea after the pound just got annihilated — and the little matter of joining the Schengen agreement, a treaty which effectively abolished border checks for member nations.